Couching is a surface embellishment technique in which one thread is laid on top of the ground fabric and secured with another thread. Sounds boring from the description, doesn't it? Well, think about this for a moment: since you aren't stitching in and out with the thread, you are able to use all weights of thread, all kinds of fibers, just about anything as the laid thread. It can be laid straight, freeform, or in patterns. Make the couching thread a matching or contrasting color, tacking either with a straight stitch, decorative stitch or even beads, and you start to get the idea: there are unlimited variations and techniques that can be used in couching. 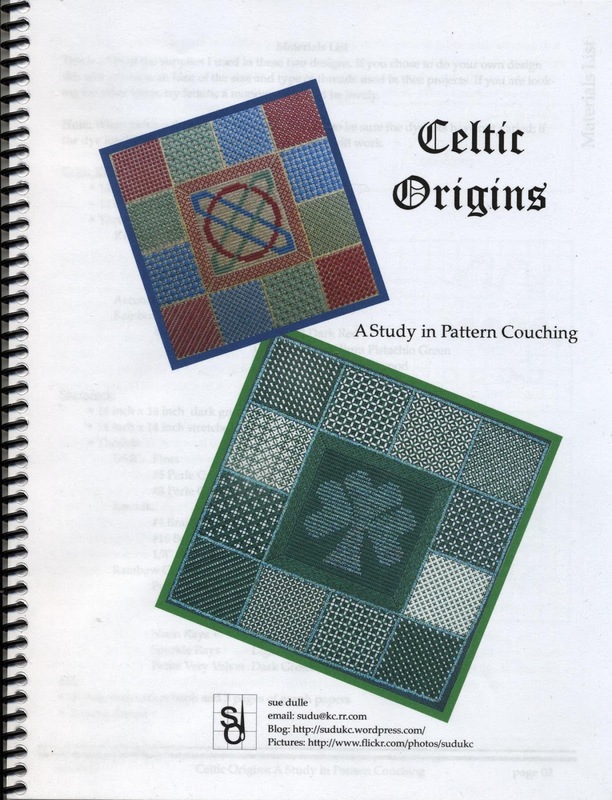 Exploring the creative world of pattern couching is the focus of Sue Dulle's new book, Celtic Origins. Two designs are offered to help you practice couching, experiment with variations, and bring this beautiful technique to colorful life. The projects feature Kreinik threads for sparkle and contrast in the couching patterns. The heavier Kreinik threads— 1/16" Ribbon, Medium #16 Braid, and Heavy #32 Braid — are perfect for this type of embroidery. 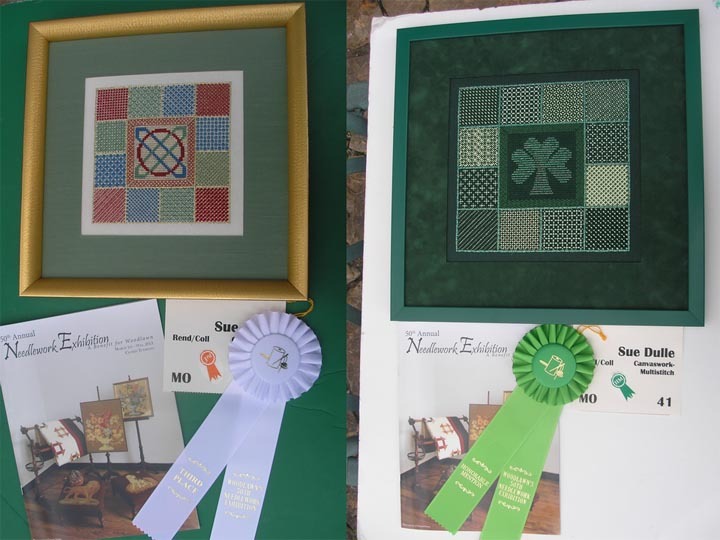 The two designs are almost like stitch notebooks suitable for framing. "The choice of designs will allow stitchers to choose a design they are comfortable stitching," Sue says. 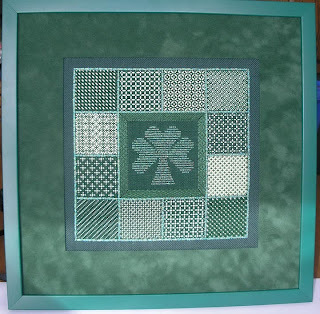 "The Celtic Knot is designed to be worked on congress cloth, the Shamrock design is stitched on 18-count mono canvas. Both will allow beginning stitcher as well as advanced stitchers to study pattern couching in a logical order." The center of each design is Or Nue while the two border areas are pattern couching designs. You may have heard of Or Nue; it is a form of couching using solid laid fillings. It's a beautiful technique that is gaining popularity right now, thanks in part to teachers like Sue creating new Or Nue patterns. This book begins with a glossary of couching terms, so you know the language right away and begin your lesson with small steps. There are wonderfully clear and detailed charts, which is ideal when you are learning a technique through a book. This is as close as it can be to having the talented teacher Sue standing right next to you as you learn. Charts are in black and white and in color. Stitch diagrams are detailed as well. Sue also includes blank graph paper pages for the stitcher who would like to create their own creative pattern designs. She knows that once you start exploring pattern couching, you will run wild with ideas. 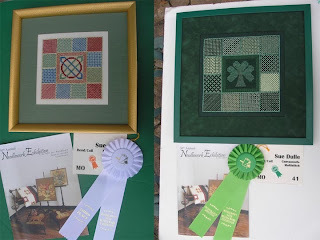 As a side note: Sue's models of the two designs in the book were entered in the 2013 Woodlawn Plantation Needlework Exhibit in Alexandria, Virginia, and were awarded third place ribbon (Celtic Knot) and honorable mention ribbon (Shamrock). The book can be ordered directly from Sue, $40.00 with either check or PayPal. Shop inquires are welcome. Nova Scotia is a wonderful place. For this year's summer holiday, my wife, Myla, and I traveled to this Canadian Province for the second time to seek out moose and whale. We found no moose, but saw a squirrel and lots of whales. If you've never experienced it, let me tell you: It is very exciting being in the Bay of Fundy smelling whale breath. I stopped to see my good friends from Dragon Dreams designs, Jennifer Aikman Smith and her husband Nick (see http://www.dragondreams.ca). We talked about the industry, her new designs and the way the design market has changed. She dropped us off at the only counted needlework shop east of Mississauga located in Moncton, Because You Count (you can find this fabulous shop on Facebook). Her store is filled with everything counted, from cross stitch to needlepoint and embroidery. Shelly told me that while I was in Nova Scotia, I had to visit rug hookers—apparently this is a very popular craft in this part of Canada. I love any type of fiber art and the whole handmade process, so we set out to visit some rug hookers. Rug hooking was made popular early on in history. It was the ultimate in Reuse, Recycle and Reposition. Canvas from grain sacks were used as the base material and cut-up fabric or leftover yarns were used to make the design. (This technique seems like a perfect place to use Kreinik Bag O'Bits, which is leftover metallic thread). First stop was in Amherst, at the studio and store of Deanna Fitzpatrick, http://www.hookingrugs.com/. She has a dye studio selling her custom-dyed yarns, a work studio, and classrooms. She is well-known internationally for her books and DVDs on rug hooking. Here, I saw very artsy rug hooking. She uses all colors of yarn to accomplish very large and beautiful tapestries. After Halifax, a wonderfully historical city, we went down to Peggy’s Cove, which is very picturesque but fairly touristy. Next, we headed to Mahon Bay where we found two other rug hooking artisans who used fabric instead of yarn. The first was Spruce Top (http://www.sprucetoprughookingstudio.com), and here you can learn the art of rug hooking, purchase finished rugs and take braided rug classes. Carol, the owner, showed us a slitting tool capable of making 1/16” widths out of any fabric or even leather. The second spot was Encompassing Designs (http://www.encompassingdesigns.com/). Christine creates charts and sells her own kits, has an exceptional selection of felt in shaded colors, and she has created many new types of tools for rug hooking. In Lunenburg, we met with Laurie Swim, http://www.artquiltpublishing.com/ author of “Rags to Riches-Quilt as Art.” Laurie took us through her gallery and studio as we talked about her work and philosophy behind making quilting into art. At the time of our visit, she was working on a large tapestry from a photograph. Later, we traveled to her hometown down the coast, got out of the car and saw the exact same landscape scene along the beach that she used in her latest quilt. The experience was remarkable. We stopped into a number of yarn shops, including Hand’s on Crafts in Yarmouth, Nova Scotia, and Cricket Cove in St. George, New Brunswick. We concluded that Canadians like to spend their cold winters with a needle in hand, and they seem to enjoy all types of hand crafting. And yes, we did see two humpback whales. Kreinik's bead-like thread just got better: Facets™ are now available in a wired version. Popular for replicating the look of beads on needlepoint, cross stitch, crazy quilting and art quilts — without having the mess of beads — this metallic thread adds a unique texture and interest to surface work. It can look whimsical and beady in certain designs, or resemble a Bullion, Frieze, or Jaceron real metal thread in more classical design themes. Four colors are now available in the new Wired Facets™ version: gold, silver, black and pearl. The wire makes couching more controllable, and give you more creative options. You can create words, shapes, figures, and motifs which will stay in shape as you tack them to your design. Couch using a matching color of Kreinik Cord or Blending Filament, or try a contrasting color for more visual interest. You can also couch Facets™ with Kreinik Silk Bella™ for a beautiful metallic-and-silk design. 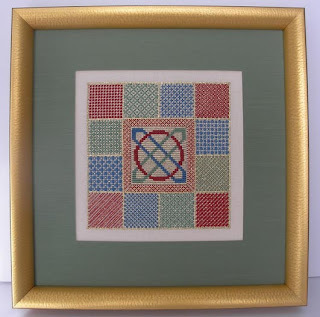 "Wait till you see what I am doing with the Facets," said needlepoint designer Jill Rigoli in an email to Kreinik recently, "It really makes the piece." 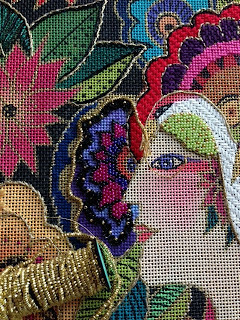 In the photo on this page, Jill gives us a sneak peek at gold Kreinik Facets couched in the Danji Designs painted canvas needlepoint (http://www.danjidesigns.com). She plunged the end to the back of her work, securing with tacking stitches, then couched the Facets™ along the gold painted area in the design. This is just a glimpse at the embellishment possibilities for this unique thread. You can use it in any embroidery, quilting, or needlework project. Couch it on the surface, rather than stitch in and out of your fabric/canvas. Basic version comes in two sizes: Facets™ and Petite Facets™ (half size) in primary colors. Now there's a wired version, Wired Facets™, available in gold, silver, pearl and black. Hand or machine washable (cool water, on gentle), and dry cleanable. Just imagine how wonderful it is to get the look of beads in a project without the mess of beads rolling all over your work. No need to stop stitching and string bead after bead; simply couch Kreinik Facets™ or Wired Facets™. Ask your local needlework store for these fun threads, or visit www.kreinik.com for more information.